Since this post was written, Greenshots has closed. C keeps telling me that this part of Gorgie Road is too far from the centre for her, but it has been my home for a number of years. We were therefore delighted at the opening of Greenshoots, a new café on Alexander Drive. While Gorgie can be a busy area, Greenshoots is on Alexander Drive and set far enough back to avoid the noise and traffic. It was a sunny day when we dropped in, amazingly for Edinburgh, and I suspect that the table & chairs will be a real sun trap (I will revisit when summer arrives properly). Greenshoots is part café and part small boutique shop. There is more than enough space to ensure that you can get a seat (I’d guess at enough for 30 souls) in a welcoming and comfortable space. There are a couple of very comfortable looking sofas in the back room, but in our limited summer I feel need to sit close to a big window. Led by Lynn and Rebecca, the team were very welcoming and made us feel at home. They are relatively new to the industry, but have definitely learned their stuff quickly (as a discussion on the flavours in their house coffee demonstrated). They have been open for a few weeks now and are starting to build up a local custom. As the location lacks the naturally passing traffic of a city centre coffee bar, they are focusing on good service and an excellent offering to bring in custom. Their food offering is a mix of pastries, cakes and light lunch options (open sandwiches, quiche, tarts, etc.). For our lunch we had a goats cheese tart and a salmon and cream cheese open sandwich. The goat’s cheese tart was good – well set off with some sharp pickled cucumber and simple chickpea salad. C’s really enjoyed her salmon and cream cheese sandwich. Her origins mean that she is always happiest when a sandwich only involves a single slice of bread and freshly sliced fish. The bread was tasty and, like many of the baked goods, was from Manna House. As it was a Saturday, we followed up with slices of Banana loaf and coconut & lime cake. C had tried their sugar free Banana loaf on a previous visit and had been looking forward it all morning. She wasn’t disappointed. It was rich and luscious, with scrummy rhubarb compote. My coconut and lime cake was also delicious, a moist coconut base with a thin lime icing. I will have choose again. I like their house coffee. I had a well-balanced long black, with that lovely smooth buttery-ness you get from Columbian on top of chocolaty Brazilian. It does not have the heavy hit that has become common from an espresso across Edinburgh, but that it a good thing. This is coffee allows a second cup without heart palpitations. Their coffee is supplied by Charlie Mill’s (Tip Top and V60s). I had never heard of them before, but look forward to trying their roasts as the seasons progress. Their shop is a real mixture of lovely things. They are developing their own range, to be called Greenshoots Living, which includes cuddly rabbits, cushions, soft furnishings and pottery. As we needed a small present for a friend, the coffee order also included a couple of quirky handmade card and a gorgeously blingy pair of shiny things. Normally I would comment on the other services (I only know about their WiFi) but its quick access from home means that I haven’t needed anything. My coffee shop visits are normally a pit stop, a chance to sit and get up to date, but Greenshoots’ close location makes it my escape from that electronic world. Most likely to see – At this early stage, it is mainly locals trying the new place (or people poking their heads in for a look around). And me, as my coffee breaks becoming worryingly more regular. 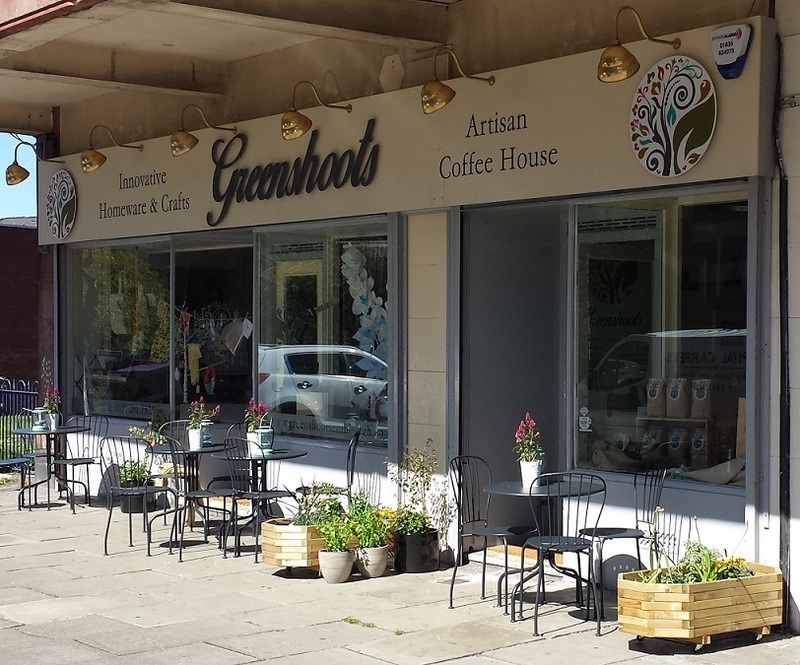 Summary – Greenshoots face some challenges being a little out on their own on the west end of Gorgie Road, but their great food, drink and welcoming service deserve a chance of success. I wish them well in their efforts and will definitely be supporting them with my custom.